If you work in email marketing, you’ve probably heard of DMARC, DKIM, and SPF. This alphabet soup of acronyms is important but sometimes misunderstood. 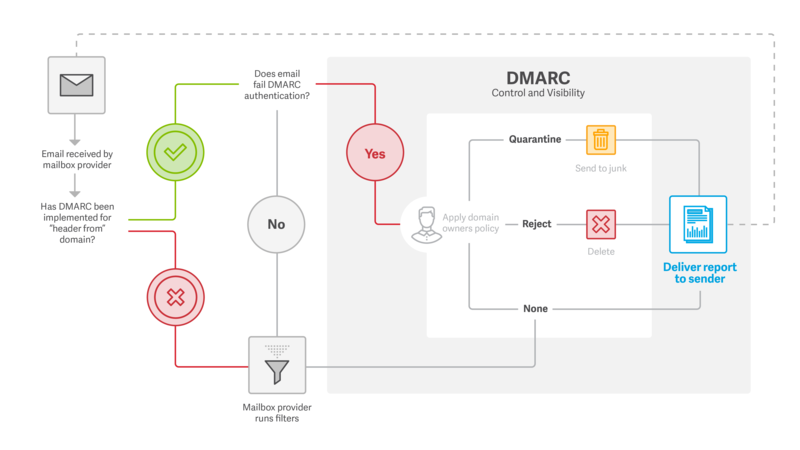 In the following overview, we’ll explain what DMARC is, why it’s necessary, how you can set up your own record, and then cover a few tips. If you still have questions, we’ll also include some resources we find helpful at the end. Ready? Let’s get started. DMARC (Domain-based Message Authentication, Reporting & Conformance) is a technology that makes it easier for email senders and receivers to determine whether or not a message is legitimately from a sender, and what to do if it is not. In the most basic of terms, DMARC is akin to checking the credentials of your email. Implementing DMARC is the best way to defend your customers, your brand, and your employees from phishing and spoofing attacks. The Federal Bureau of Investigation looked into just over 22,000 of these incidents involving US-based businesses from October 2013 to December 2016. In total, they found losses approaching $1.6 billion. That’s roughly $500 million every year being scammed and dollar figures involved have climbed sharply—up 2370 percent between January 2015 and December 2016. And that’s just from the reported cases. This technology can also improve how your emails look to subscribers. DMARC can help enable images and features from mailbox providers, such as the “from” profile image for Gmail users. Unfortunately, the Federal Trade Commission found that less than 10 percent of top online US businesses use DMARC’s “reject” policy—the strongest available tool—to automatically block unauthenticated email. The study concluded that businesses who want to stop phishing and better protect their brands should implement DMARC—and with good reason. SPF (Sender Policy Framework) and DKIM (DomainKeys Identified Mail) make up the DMARC process. To pass DMARC, a message must pass SPF authentication and SPF alignment and/or DKIM authentication and DKIM alignment. A message will fail DMARC if the message fails both (1) SPF or SPF alignment and (2) DKIM or DKIM alignment. Why would you want to see this data? DMARC is the first and only widely deployed technology that can make the “header from” address (what users see in their email clients) trustworthy. Not only does this help protect customers and the brand, it discourages cybercriminals who are less likely to prey on a brand with a DMARC record. Properly implementing SPF will probably be the most time consuming and cumbersome part of any email authentication infrastructure implementation. Because email was historically very simple to use and manage, and completely open from a security and access point of view, organizations didn’t enforce strict policies around who can use it and how. This resulted in most organizations today not having a complete view of all the different sources of email, both internally and externally. The single biggest problem when implementing SPF is attempting to discover who is currently legitimately sending email on your behalf. If you use a proprietary or third party marketing mail solution, the infrastructure should be separate from production email gateways. If your mail delivery network is exceptionally complicated, you may proceed with documenting the current state in your SPF, but do take time to clean up the situation promptly. If you serve multiple domains over the same infrastructure, you may want to create a single universal SPF record and reference it in individual domains using “include” mechanism. If your domain names are aligned, you will be able to instruct mailbox providers to reject any malicious emails purporting to be sent by your brand. If your domain names are not aligned, you can still proceed to create your DMARC record. Work with your IT department, security team, and marketing decision makers to decide on a strategy for fixing the issues. Through DMARC, you will receive aggregate and forensic (message level) reports daily. Designate the email account(s) where you want to receive these reports. You may want to use two separate accounts, as you could get inundated with the data! Your DNS administrator should be equipped to assist you with this change. Reaching out to your IT department, security team, or even your ESP should work. Making updates like this go beyond a simple login. If you want to see what your current setup is, use a DMARC lookup tool. We like this one from Proofpoint, which doesn’t require a login and provides a key to what your tags mean—but more on that later. Reporting can be difficult to parse because reports are provided in a raw format. If you’re having issues, you might have to engage an outside company to help. We can provide a reference—simply contact us here. If you’re a Return Path client, you can reach out to your Technical Account Manager or Account Coordinator. There are many DMARC tags available, but you don’t have to use them all. In fact, you probably want to keep it simple! Using Proofpoint’s lookup tool, you can see what tags your record currently has, as well as learning what others mean. Again, no login or account creation is necessary. If you need to change something on your record, you will probably either rely on your DNS administrator to make a quick update, or generate a new text record to copy and paste into each of your sending domains. Because of the complexity of the process (and the potential issues that can arise), we like this tool from Proofpoint. There are a good number of DMARC record generators out there—just be sure to select one you trust. Work with your DNS administrator to add your DMARC record to DNS and start monitoring your chosen domain. After you copy and paste your text record into each sending domain, you’ll start receiving daily updates on your entire email ecosystem, including who is sending email on behalf of your brand, which emails are getting delivered, and which emails are falling short. Again, the reporting is complex. If you’re struggling to make sense of your data, we can help. Simply contact us here or, if you’re a Return Path client, reach out to your Technical Account Manager or Account Coordinator. Although we do not directly provide email fraud services, we can certainly recommend companies that do. Get your team on board. Earlier this year, Forbes published a report on the FBI estimates of phishing scams. On average, scams like this cost American businesses half a billion (yes, billion with a ‘b’) dollars each year. The FBI bulletin reminds readers that no business is immune. Don’t wait. You don’t have to be a DMARC expert to start the process. By implementing DMARC with a mail receiver policy set to “none,” you will receive the information you need via DMARC reports without impacting the deliverability of your legitimate messages. The information provided in these reports will grant the visibility you need to make informed, data driven decisions. Identify third-party senders. You have much less control over the authentication practices of the vendors authorized to send email on your behalf. Make sure you know who they are and what they’re doing. Ask for help from your partners. Your ESP, agency, and anyone else you work with related to email marketing are resources—use them! They can answer questions for you, provide best practices, and offer real life examples of how to solve your issue. Stay up-to-date on the conversation. Return Path partners with the industry’s top standards and policy setting organizations to help senders, receivers, and consumers get more from the email channel. Visit the Member Associations page on our website to view a list of all the groups committed to better email practices and reporting.